Light's latest machinations are putting a strain on even his formidable intellect as Near flies to Japan to beard Kira in his den. Near is sure that Light is Kira, but his sense of honor as L's heir will allow no doubts. 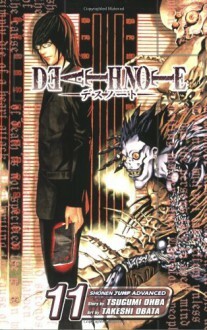 He doesn't want to just stop the Kira murders, he wants to expose Light as the Death Note killer. Light thinks he's up to the challenge, but will the pressures of his fiancée, his new flame, and his acolyte prove to be fatal distractions? The penultimate volume. You can feel the plot starts to thicken but at the same time there is still quite some filler. On the one hand, by now I feel ready to finish the series, on the other hand I will miss it when it's done. One more book left... I don't think I need to read it to know that this is now my favorite manga series of all-time.. Granted, I've only read as many series as I could probably count on one hand. Near and Light are both positioning for the final Showdown. Near is flying to Japan to meet "L" aka Light. Next volume or the next will be the end. Looking forward to see how it all wraps up. Some of the "Rules" could make things really interesting, since they involve the shinigami.